The GOP candidate attacks Romneycare, but his for-profit policy shop backs its most controversial provision. In CNN’s Republican presidential debate last month, Newt Gingrich and Mitt Romney tangled after the former Massachusetts governor declared that the idea behind Romneycare’s individual health care mandate had come from Gingrich. “You did not get that from me,” Gingrich thundered, before eventually conceding that in the early 1990s he and the conservative Heritage Foundation had backed the idea of a mandate compelling individuals to purchase health insurance. But, Gingrich contended, he had done so only in opposition to the health care proposal then being promoted by Hillary Clinton. What Gingrich didn’t say during this dust-up was that the Gingrich Group, a consulting firm the former GOP House speaker founded in 1999, currently promotes a plan that includes an individual mandate. 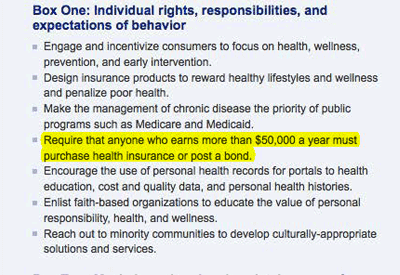 Require that anyone who earns more than $50,000 a year must purchase health insurance or post a bond. I am completely opposed to the Obamacare mandate on individuals. I fought it for two and half years at the Center for Health Transformation…I am against any effort to impose a federal mandate on anyone because it is fundamentally wrong and I believe unconstitutional. As Gingrich has ascended in the Republican polls, his long career in government and the private sector has begun to draw scrutiny. This week, he caught flack for claiming that he pocketed a $300,000 fee from Freddie Mac, the government-sponsored housing outfit, for advice he provided as a “historian.” But, as Bloomberg reported, Gingrich received up to $1.8 million from Freddie Mac for providing strategic counseling, under contracts arranged by the group’s chief lobbyist at the time. (The money was paid to the Gingrich Group.) And Gingrich is also attracting attention for assorted flip-flops on climate change, Rep. Paul Ryan’s plan to end Medicare as a guaranteed benefit, the US military action in Libya, and other weighty matters. When it comes to health care mandates, it’s hard to tell whether Gingrich’s position constitutes a flip-flop or a dizzying gyration. The episode does show a classic Gingrich pattern of issuing too-clever denials in conjunction with fierce attacks. Throughout this campaign, he’s tried to distance himself from the mandate minefield, and during the mid-October debate exchange with Romney he suggested that his support for a mandate was two decades in the past and had merely been a tactical move at the time to thwart the dreaded Hillary Clinton. Not true. In recent years, he has supported mandates (or not, depending what statement you look at). But his Center for Health Transformation—which he often touts on the campaign trail—still does, without apology or spin.